1. Start buy making Sushi Rice (If not available at your market, then find a Japanese food market) Cooking this rice is the same as any other, but the rice has a different shape and consistancy. We use a Rival rice cooker we picked up at Wallmart for only $20. It works Great! If you have purchased powdered Wasabi, mix it now as it takes 30 minutes to season properly before using. 3. After the rice cools, get out a cutting board (preferrably a plastic non stick type) and also fill a small mixing bowl with water. You will make small mounds (like in the photo) of rice and place them on the cutting board. You will use the water to wet your hands to mold the rice into mounds. The water will keep the rice from sticking to your hands. I like using a soup spoon to help me mold the mounds. 4. Make up the small mounds of rice about 3/4 - 1" wide (and tall) and around 2.5" - 3" long) and place them on the cutting board. 5. Make sure you have cut the bones and bloodline out of your fillets. Select a piece that is approximately 3/4" - 1" thick. 6. Make sure to have around 1/6 - 1/4 pound per person. 7. Slice the fish against the grain so that the grain of the fish is visible in every slice. Cut slices around 1/8" thick. 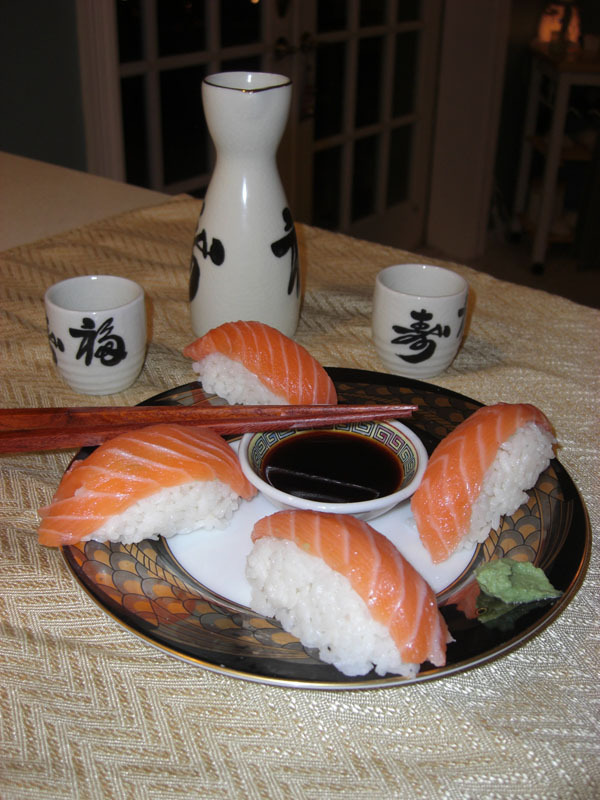 (Cutting these slices against the grain is same direction as perpendicular to the fish's backbone). If your filet is thin, cut at an angle to make your slices wide enough to cover your rice mounds. 9. 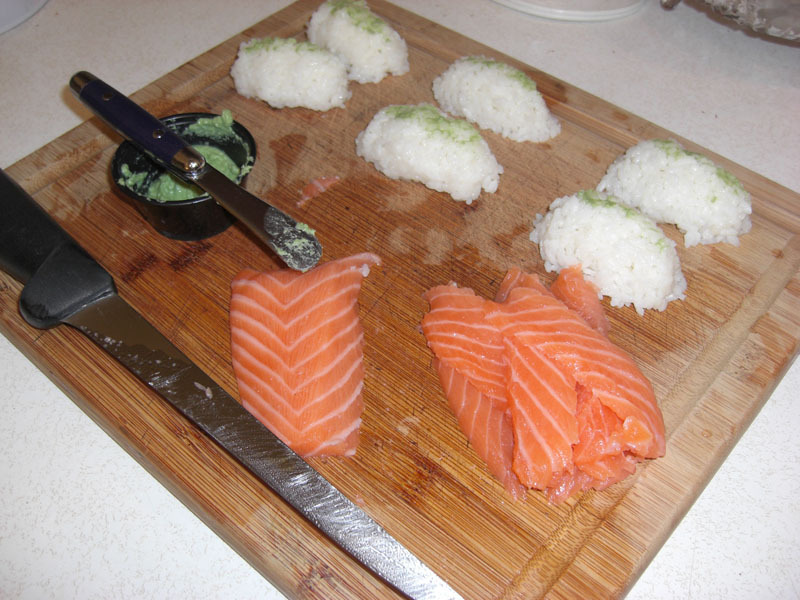 Lay your fish slices on the top of each mound of rice as shown in the photo.